Brian Fine has put together an article that will help us understand a little better about how to protect ourselves from all that nasty SPAM! Here is a little excerpt from the article or you can click here to read the entire article. By now anyone who regularly uses email is familiar with the idea of spam. To be considered spam a message has to be both unsolicited and bulk. Unsolicited means that the recipient has in no way requested or subscribed to the messages. Bulk means that the message is sent out to a large (hundreds to millions) of recipients. Spam messages cost money. First there is a cost in resources: bandwidth to deliver the message, and server memory and space to process it. Second there is a cost in man-hours, as the recipient has to “sort” through the spam on the chance that an actual email is there. Google seems to be offering something new every day. Of course a lot of their tools have been around for a long time and we just don't have the time to look at each and every one of them. I have been playing around with Goggles Blogger program, adding extra gadgets, and trying to add to the look and feel. Very nice program, very simple and very straightforward. You can add the basic elements that you want to have added to it, add your own code if you want to or leave it plain and simple like I have. If it weren't for the integration of Microsoft's Live Spaces I would probably move to this in a heartbeat. I like it that much better. The other Google product that I started playing with is the Google Reader. This product allows you to create an RSS Feed Aggregator. What this means is that you can select all your different RSS feeds and look at the current postings all on one page. It is like building up your very own technical/personal online newspaper that you can view each morning with your cup of coffee. It allows you to quickly drill down into the articles that you are interested in which for all of last time sensitive information workers is extremely important. The other benefit is that you don't have to worry about installing a news aggregator on your machine like Newsgator and others, and this setup is available to you on any machine that has Internet access. This makes it very portable just not available when you don't have Internet access. OK, you're now seeing me using voice to text recognition and it is being recorded by the Jing. So we will insert the URL at the bottom of this message and you'll see it appear at the bottom of this message. This is really a neat application. You have to be very careful on how you use it but if you understand what is going on in the screen sizes that you have to deal with you can get a good feel for what the other person will see you when you produce what you are creating for them. You will see what I ran into when trying to record and use voice recognition at the same time. I am looking forward to putting together a lot of quick training videos they can be shared on the fly both internally in our company as well as with our customers. This program is offered by TechSmith who also makes Camtasia a program that I use for capturing screen displays for training purposes. This is a beta program that you can take advantage of the share information quickly with customers and friends and family. To get more information on this product please visit http://www.jingproject.com/. I can't imagine anyone who likes the daily ritual of pressing the delete key to rid themselves of all of their unwanted, unsolicited e-mail spam. There are 23 of us in our office, and if their incoming e-mail is anything like mine then this problem causes them all to lose between 45 minutes to an hour of productivity each and every day as they check their e-mail. To resolve this we implemented a system from Astaro that we use as a Security Gateway for all of our Web Access. The nice thing about this product is its unified approach for our total IT Security Protection. Astaro Security Gateway provides immediate protection for your network, web access and email traffic. The Astaro solution integrates more security applications than any competitor in one award-winning management device. A complete range of hardware appliances scale to the performance level which you demand. For more information on this product and it's capabilities be sure to visit our Solutions Center webpage and contact us so that we may configure the right system for you. Last Wednesday's release candidate is termed a Feature-Complete Beta of its Hyper-V virtualization technology, which is an add-on to Windows Server 2008. A release candidate is a final beta before the code is considered finished. Microsoft said it was on track to ship Hyper-V by August. The code is available on Microsoft's Web site. Jeff Woolsey, senior program manager on the Microsoft virtualization team, says the three most common roles virtualized among early adopters are IIS, application server and Terminal Services, and that the four most deployed Microsoft applications are SQL Server 2005 and 2008, Exchange Server and Forefront. He said more than half are running an antivirus/security application, nearly 50% are running a backup appliance, and approximately 75% are running Hyper-V with some attached storage. On another note, Microsoft acquired desktop virtualization vendor Kidaro. Kidaro offers management technology aimed at making it easier for enterprises to deploy, use and manage virtual PCs. The platform comprises several components including a client that handles encryption and firewall security and integrates the virtual machine applications into the end-user computer. The management server assigns configurations and security policies for users and compiles information about clients for monitoring and auditing. Microsoft expects that the software will help accelerate migration to Windows Vista because it can minimize compatibility issues between applications and the OS. In addition, the software makes the use of virtualization less noticeable to end users, which should also speed adoption, Microsoft said. As catastrophic as losing all the information on your hard drive can be, if you have performed consistent backups you should come out better in the long run. Luckily, three weeks ago I began testing a new offsite backup product called Carbonite to back up my critical data on my notebook. The backups took a little while to complete, about four days for 25 GB of data, but it made it very easy for me to get download my OneNote project files to another computer while I had the service department replace the drive and bring it up with a fresh load of Vista Ultimate. It took about a week to reload the different applications that I run but I now have a system that is consistently faster, and doesn't have the garbage on it from loading and unloading test applications. Refreshing your computer by doing a fresh load every 3 to 6 months does wonders for your productivity. The downside is the time lost during the reconstruction. During the down time, I was using my desktop from home at the office. I didn't want it to be joined to our network so I started using the terminal server client to access most of our applications that I run on a daily basis. What struck me was how painless it was to be able to jump between the live windows session and the terminal session as I was doing different projects. The one drawback I did find was that because I did not join this machine to the network was a little hard to move files between two sessions. But it could be done without too much trouble. Now that I have the laptop up and loaded, I am running most of our legacy applications, we have some Access 97 databases, our accounting system, and our CRM program that are rather dated, on a terminal server. And I am running all my research with Internet Explorer, OneNote, and Office Applications in the notebooks operating system. Because I'm using their RAM from the terminal server I have found that I'm running much faster than before when I have ten to twelve applications running at the same time. It makes sense now that I think about it and I am glad that have taken advantage of this ability. If you have any questions about the process I went through or if you want to know more about remote access and terminal services feel free to let me know and we can discuss this further. Happy Easter! I have been working with the Camtasia Studio product for a month now and I am so thoroughly impressed with it's capabilities. This is a great product for anyone who needs to either present their company or product lines or needs to provide training materials for their employees or for clients. It took only minutes to get a feel for how easy this program works to give you professional quality presentations in most of the formats that you would possibly want to publish in. You will see more and more projects from my desktop becoming available in the next few months as we continue to produce new content on our Product Solutions Showcase. Look for demonstrations on equipment, programs and gadgets that may interest you. As always, we are open for suggestions for content that you might be interested in. This past weekend I have some strange things occur with my system that I attributed to some Microsoft updates that had come down from on high, but as it turns out it probably was my hard drive failing. On Tuesday it finally gave up the ghost, and totally crapped out. Over the last few days I have let the guys try to resurrect my drive but to no avail. So I've been working with my desktop from home running completely within terminal server and it really hasn't been a bad experience except that I'm down to one monitor now instead of two. Using terminal server, I don't see how I can have two monitors up and running to show me two sessions at once. Once again the new drive installed an up and running it will be hard to run might primary applications for research in communicating with my customers on the machine and still run terminal server for all my legacy applications. That really seemed to work very well and I kept the speed up the cause I had fewer applications running locally and within the terminal server window I was using the memory from the server rather than on my local machine. It's just like having two computers on my desk which helps me to expand my capabilities and increase the responsiveness of both systems. So next week I'll run it through that scenario and I'll report back on how well it works. Here is a short blurb from their site: "Goodwill will consolidate and sort equipment for shipment to a Dell product recovery partner for reuse or recycling. Equipment that meets minimum standards will be refurbished and resold and all proceeds will support its non-profit job training and community programs. Equipment that cannot be refurbished will be responsibly recycled. Donors will be responsible for removing data from hard drives and other storage media before donating to Goodwill." I converted the video from QuickTime to Flash so you can easily view it. Great little alternative program to Adobe Acrobat Writer for doing PDF Conversion and Document Management. 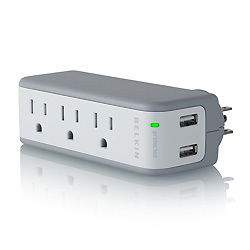 The Belkin Mini Surge Protector with (2) USB Charging Ports. I admit, I am a gadget freak! I can't begin to tell you how many different Electronic Devices I carry with me even on a short road trip. I always have my camera, battery charger for the batteries that go into different devices, my GPS, my Zune, my laptop, my phone and portable speakers. You know I can't go for a minute without being entertained by something! For just $24.95 this little device turns one outlet into three plus gives you two charging USB ports. USB connections are for charging only and cannot be used as a USB hub. What a great little product that doesn't take up much room in your bag. Any one who knows me, knows that I am so in love with using my time as effectively as possible. Time is the one commodity that once it is used is definitely lost. I love to fill this time with things that either entertain or educate me. There are many ways to get, view and distribute all the information that is available both on the Internet and other sources. If some of the information that you are looking for is available through the Internet it has probably been made available through either a RSS feed and/or through podcasts indication sources (which is a fancy way of saying iTunes). I subscribe to many podcasts using the Zune Marketplace. This is a free alternative to iTunes that works well whether or not you own a Zune Media Player or not. Several of us at the store recently picked up the new Zune 80 GB media player. I am currently running Vista Ultimate on both my work machine as well as my best of the home that I'm using as a media center system. This in works especially well on the desktops system because it is capable of importing TV shows that are recorded from the media center system. Takes about 20 minutes to upload a show but it comes across very well. I've also taking some of the home movies that I have created and uploaded them to the media player as well. With podcasts, choose which ones you are interested and subscribe to them, and then mark them to the synced with the Zune. From that point on every time you connect your Zune to that computer it will check for updates from the market place download the new episodes in automatically upload them to your media player. It's that easy! If you are interested in joining the Zune Social, as it is called, go to www.zune.net/setup to install the application on your machine that will allow you to connect to the Microsoft Zune Marketplace. Enjoy! Really Simple Syndication (RSS) is a way for content publishers to make news, blogs, and other content available to subscribers. You can view RSS content in Microsoft Office Outlook 2007. Using RSS, publishers can make content and updates available for download by subscribers automatically. The content on all Web sites is not available as an RSS Feed, but the list is growing daily. How does RSS work in Microsoft Office Outlook 2007? - RSS readers, such as the one built into Office Outlook 2007, allow you to subscribe to RSS Feeds and then read content or follow links for additional information. Whenever you see a link to a feed, or an RSS icon such as the one at the top of this page, just click. Microsoft Office Outlook 2007 will automatically subscribe you to that RSS Feed. Get started - Using Microsoft Office Outlook 2007 to subscribe to an RSS Feed is quick and easy and does not involve a registration process or fee. After you subscribe to an RSS Feed, headlines will appear in your RSS folders. RSS items appear similar to mail messages. When you see a headline that interests you, just click or open the item. For more information, read how to add an RSS feed to Microsoft Office Outlook 2007 and how to read your subscribed RSS feeds. Below is a sample of the many feeds you can subscribe to from around the world. Click on the links that interest you and Outlook will subscribe to them. To take advantage of capability all you need to do is add a new News Source to your RSS Feed List. Right click on the RSS feeds folder and choose add a new RSS feed. The dialog box will appear on screen that you need to enter the address of the RSS feed that you want to subscribe to. The easy way to get this information is to browse to the hosting site that has the information that you are interested in and click on the subscribe to RSS feed hyperlink that will be located on that page is there it is and RSS feed subscriptions option available. When you press this choice and new page will appear in your browser. Copy the URL to the clipboard and jump back to your open outlook dialog that is requesting the URL of your RSS feed. Paste it into the field and then press the add button to add it to your list. The next time outlook downloads new mail it will also download any new RSS feeds as well. For a long time, we have been supporting several packages that allows schools and libraries Computer Equipment to run applications that lock down the computer so that they can be managed and protected from abusive users. These products and set-ups have been hard to use, expensive, or both. Microsoft has come out with a free software download that allows you to manage computers in a school computer lab or Internet cafe, a library or even in your home with a program called Windows® SteadyState™. Here is a brief description: Windows® SteadyState™ is now available. (Windows SteadyState was formerly known as Microsoft® Shared Computer Toolkit for Windows XP.) Whether you manage computers in a school computer lab or an Internet café, a library, or even in your home, Windows SteadyState helps make it easy for you to keep your computers running the way you want them to, no matter who uses them. Windows SteadyState is easier to download, set up, use, and maintain than Shared Computer Toolkit. Windows SteadyState runs on genuine copies of Windows XP Professional, Windows XP Home Edition, and Windows XP Tablet PC Edition. And, Windows SteadyState is offered at no charge to Windows Genuine Advantage customers!